I've been working with 3rd-6th grade students on biographies and autobiographies. Such treasures are available in this section of the library. Kids don't usually think about all the variety there and biographies are much more creative than they used to be. I discovered this book as I pulled books to design this center-based activity for 5th and 6th grade. I wanted them to discover new people for their projects and also just for life knowledge. 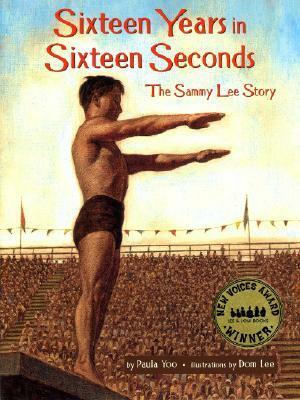 In 1932 12-year-old Sammy can only watch others swim at the local pool except on Wednesdays. Because of his skin color he has to wait for one day of the week to be allowed to enter the public pool. Crazy, right? As he watches he sees one boy fly into the air and dive off the diving board. His thought is he wants to do that. The next Wednesday Sammy works on diving and his friend Hart challenges him to flip. Sammy continues to work on diving and eventually was able to work with a coach. His father, though, really wants Sammy to fulfill his dream of becoming a doctor. The cool thing is he does-he goes on to study medicine but also continues to dive. He experiences discrimination at every step of his life yet he kept pushing through and challenging himself. At the age of 28 he became the first Asian American to win a gold medal and then he defended his gold medal at the 1958 Finnish Olympics. What an amazing life he led. I loved discovering Sammy's life and sharing it with students. I wonder what other treasures are stuffed in our biography section.